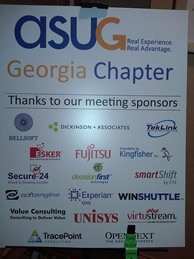 I have just returned from the Georgia ASUG chapter meeting and Business One Summit at the Legacy Lodge, Lake Lanier near Buford, GA. As with any of these gatherings, there were many people in attendance but with this particular gathering the focus was a little muddied by the consolidation of the meeting into an ‘all-the-SAP-products’ gathering. Green Brushy was well-received as usual, the break-out rooms were quite roomy and comfortable, and there was plenty of discussion space and a very upbeat vibe from those attending. 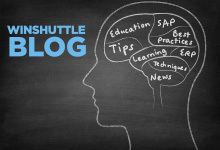 ASUG meetings tend to be a somewhat mixed bag of content, vendors and participants but the inclusion of the SAP Business One customers in particular certainly proved challenging when understanding the context of customer problems. This event, sponsored by ASUG and not SAP, is designed for SAP Business One users specifically but as an ASUG chapter meeting also, there were plenty of ERP customers in attendance. An item of possibly the greatest interest, was the fact that many of the SAP customers that I spoke to, still have problems with collaboration, master data quality and mass create and change scenarios even with BusinessOne. In the realm of Winshuttle it is unfortunate that we don’t yet have a solution for B1 customers to address these scenarios. Of additional interest was the number of vendors offering very segment specific solutions such as Asset Management. This seems to be a market expanding with opportunities with SAP having provided an SDK for customers and partners alike to build add-ons. From a purely Winshuttle perspective it was good to connect to with existing customers and discuss their current use of the products and discuss opportunities for more flexible ways with other products in the suite, in particular Workflow and Forms. The break-out session that I gave to a mixed audience of people afforded me the opportunity to explore how SAP customers want to leverage Microsoft SharePoint technology together with SAP without having to make significant changes to their IT landscape. I introduced the audience to the concept of BUAD and for the most part this seemed to be something that everyone agreed with and felt was likely to become increasingly prevalent in the future. 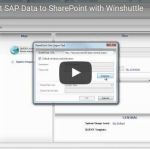 Winshuttle’s real experience in the context of using SahrePoint with SAP demonstrated appropriately, real advantage..
Unsurprisingly, three topics came up in the presentation. Field level validation, security authorizations and change management. Dealing with each of these separately of course at the field level, much of your validation is prescribed by the requirements of your SAP configuration but we also know that in some instances, validation has been handled a little lazily or more loosely so as to support a more flexible SAP system. The beauty of using transaction recordings with Winshuttle Transaction or using a Winshuttle form is your ability to further restrict the data that can be entered using the automation or UI simplification object. This means that even if you are using an Excel spreadsheet you can contextually limit the data for a given field. Transaction recordings of course respect all the authorization limitations associated with your particular user ID, this of course assumes that you are using your own credentials and not proxied credentials. Additionally; when using Winshuttle Server with Transaction recordings; you have the ability to explicitly invoke your credentials by entering them in the form directly. This is a great capability particularly when working with mobile devices that are not, for example, part of your conventionally authenticated network. This means theoretically that any application that can pass credentials to a webservice, could invoke a transaction. This powerful capability means that competent transaction authors can expose flexible SAP transactional objects to a wide array of internet devices. In the realm of BAPIs and Function Modules of course the security requirements are a little different as compared with regular transactions but these can also be exposed in a similar way and with the same level of security assurance. The quality of your SAP security is paramount here. Finally change management: SharePoint of course has established itself as a tremendous resource for document management and version management of those documents. Accordingly; automations that you create today can be superseded by better or enhanced automations and form versions with full audit history and version reversion capability. Unlike SAP which requires a ‘fix forward’ approach to technical objects; SharePoint does support the idea of ‘undo’. When this inherent capability is combined with Winshuttle Central and the out-of-the-box SharePoint workflows you have the best of several worlds. A technical object approval process, document and object states as well as the ability to revert to last good versions.